"Deeply harrowing. Moving, measured and provocative. 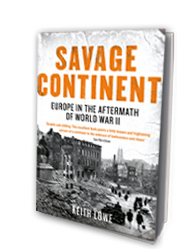 A compelling picture of a continent physically and morally brutalized by slaughter"
"Essential. A serious account of things we never knew and our fathers would rather forget. Lowe’s transparent prose makes it difficult to look away from a catalogue of horrors . . . you won’t sleep afterwards. Such good history it keeps all the questions boiling in your mind"
"Shocking, touching, very well written"
"Searingly superb, brilliantly organized and scrupulously researched . . . a major new historical talent has arrived"
"Horrifying. A complex story and Lowe tells it very well"
"Grimly absorbing, conveys the pity of war and its sorry aftermath with integrity and proper sympathy"
"Vivid . . . Lowe has a good eye for revealing details"
"Extraordinary, exceptional. Reveals a continent where moral values were often missing and basically lawlessness prevailed for several years"